Beetroot is a healthy vegetable that is reddish purple in color and is known by various names like garden beet, red beet and table beet. You can have it raw with salads or cook it and consume it. It is a rich source of potassium, iron, magnesium, Vitamin A, C and B6, nitrate and so on. Consuming beetroot regularly is of great benefit to the health, skin and hair. Beetroot as well as all other vegetables make the body strong enough to fight against foreign bodies and prevent infections. Some vegetable help you to lower the levels of cholesterol while others are effective in maintaining normal blood pressure. But when you need vegetables that are excellent for your skin, beetroot is the right choice. With its detoxifying properties, beetroot helps in cleansing the blood and removing all toxins and waste from the blood. This makes your skin healthy and provides it a natural glow. It is also rich in antioxidants, which can fight against the free radicals and keep your skin looking young for a long period of time. The benefits of this vegetable for the skin are so large that you may have it any form and it will keep your skin fair, glowing and young looking. Beetroot is rich in minerals, vitamins and other essential nutrients that keep your skin healthy and glowing. Moreover, beetroot is also very effective in detoxifying your blood and making the skin blemish free and radiant. Acne and pimples are a result of impurities present in the body. So if you are suffering from such problems of the skin, consume a glass of beetroot juice daily and soon you will have a clear skin without any blemishes. Beetroot is beneficial for increasing the blood circulation in the scalp as it is rich in various nutrients like potassium, phosphorous, vitamins and other minerals. It can help the scalp to get rid of dead skin and excess oil and thus helps in hair growth. The antiseptic and anti-inflammatory properties of beetroot keep the scalp healthy and help in keeping it free from dandruff. It also opens up clogged pores in the scalp and enables the roots of the hair to absorb more nutrients. The carotenoids present in beetroot makes hair grow thick and long. It also makes the hair lustrous and healthy. Because of its dark color, beetroot is used as a coloring agent in many beverages and foods. It is also used as a natural hair dye to color your hair. Antioxidants are important to provide you a strong immune system. Fruits and vegetables that are colorful are said to be rich in antioxidants. Beetroot is a rich source of the antioxidant beta cyanine, which can lower the level of LDL or bad cholesterol in the body. As one becomes older, a decline in mental power is noticed. Some people start losing memory power with advancement in age. Beetroot is very beneficial for preventing this problem. Having beetroot regularly helps in increasing the blood flow in the brain and this can reduce the risk of dementia. Fiber is found in high amounts in beetroot. This helps in lowering the level of cholesterol in your body. So, consuming beetroot regularly helps you to control the cholesterol, especially the bad cholesterol, and prevent various diseases of the heart. Beetroot helps in stabilizing the level of glucose in the blood. So, it is of great benefit for diabetic patients. If they consume beetroot juice regularly for three weeks, it can greatly reduce the level of blood sugar. Having 250 ml of beetroot juice before you do any exercise or physical activity enhances your performance. This is because beetroot juice has the power to stimulate your blood vessels. This juice also provides you instant energy. Beetroot has great medicinal values. Consuming the juice of beetroot daily is very effective for preventing cancers of the colon and liver. This is because beetroot can remove toxins from the body and purify the body. It is often called as the ‘liver’s best friend’. If you are on a weight loss diet, beetroot is the right food for you. It is low in calories and rich in fiber. The fiber in it prevents accumulation of fat and also removes toxic substances and excess water from the body. This helps in making the skin radiant. Beetroots are rich sources of various nutrients that help in enhancing your immune system as well as help in the formation of new blood cells. 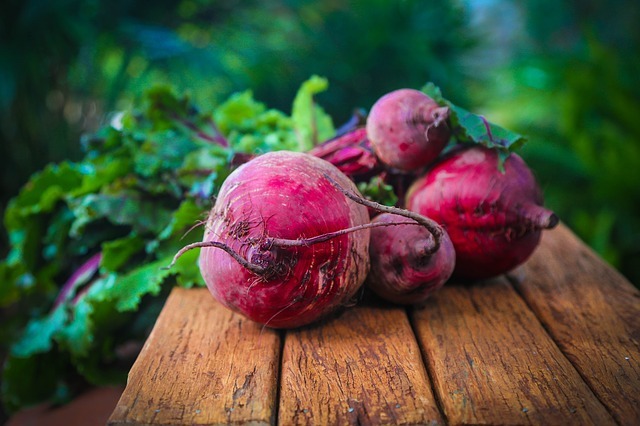 Raw beetroot is loaded with minerals and vitamins. Vitamin C, magnesium, potassium, iron, zinc, folic acid, fiber and carbohydrates are found in high amounts in raw beetroots. Iron present in beetroot is good for preventing anemia. Being rich in nitrates, beetroot can reduce the risk of stroke, high blood pressure and diseases of the heart. The reason for it is that nitrates present in beetroot get oxidized to nitric oxide when it is mixed with blood. This helps in enlarging the blood vessels and thus increases the amount of oxygen in the blood. So, include beetroot in your daily diet and have a healthy heart. Beetroot is rich in minerals like silica, which helps the body to properly utilize the calcium consumed. This leads to stronger and healthier bones. Beetroot is also rich in magnesium, Vitamin C, folate etc, which also help in providing you strong bones.